RSS Guard latest version 3.5.5 is released. It is very useful website for those who are eager to get updates from various websites. RSS Guard is very easy to use and light weight. RSS Guard supports RSS, Atom and RDF standards and you can add news and feeds from any website. 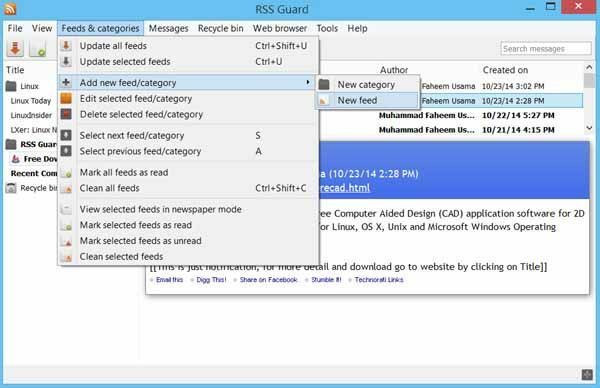 RSS Guard is very easy to download and install. Download the setup file from the download link given below. It will take few minutes to complete the installation. After installation, you can run the application and start to get feeds or news updates from your favorite website. The top menu of RSS Guard contains various items. From the menu “Feeds & categories”, you can add the URL from where you want to get feeds. It is very simple and easy to add new websites using the rss or feed address (URL) of that website. For example, you want to add the feeds of PCFavour, click on “Feeds & categories” from top menu. Now click on “Add new feed/category” and then from extended menu, select “New feed”. Keep all as default and enter the Title for your feed. You can add website title here. In “Description” space, you can add some words about the website or feeds you are adding. Otherwise, when you click on “Fetch it now” button, it will add the Title and Description from the website automatically. In URL space, enter the URL of the Feed. Remember that, it will not work if you enter the website URL. Only enter the feed address. The format of the feed address varies for different websites. For example, if the website is attached with FeedBurner, then the address will be, in case PCFavour, http://feeds.feedburner.com/pcfavour. For some websites, it may be as http://www.example.com/feed. You can get the Feed address of any website from the home page of that website.